So you’ve decided that you’re getting a longboard, and you’ve run into a problem; which type of longboard should you buy? There is no "perfect longboard", so you'll have to decide for yourself. The first thing to consider is what you want to use the board for. Check out the different longboard styles below to figure out which type of board will suit you the best. Before you purchase a board you should ask yourself what you want to use it for. This will greatly influence the type of deck you should be looking at. Cruising is the most common form of longboarding for anyone from a beginner to an expert. 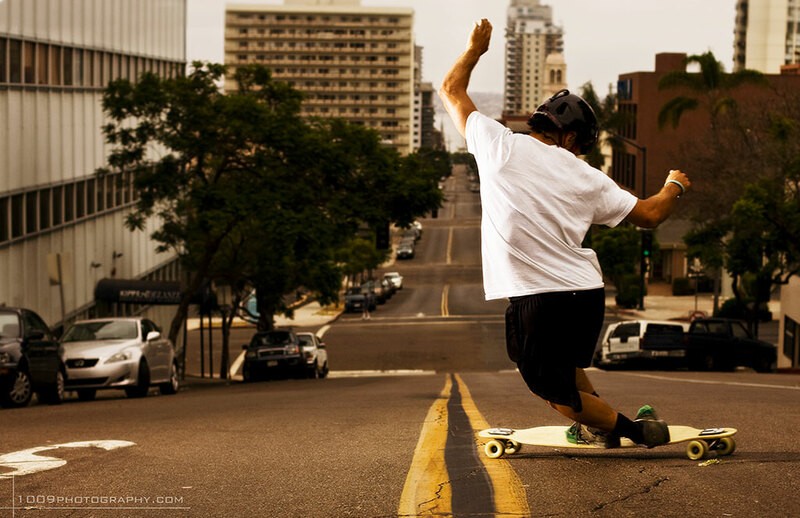 Carving is when a longboarder makes controlled turns on the road by leaning forward onto his toes (toe side turns) or backward onto his heels (heel side turns). When these turns are strung together, the result is an S-shaped line that will slow down the rider and provide a good opportunity to rack up some style points. If you’re not sure where to start, longboards in the range of 32”-42” are the perfect choice to get moving! Most cruising longboards you’ll see on the street will be in this range. Flex is certainly something to consider for your cruising longboard deck. Having a board that flexes can be a great help on those long rides and will absorb some of the rough terrain you may encounter. Some people love flexy boards for the enhanced spring and rebound, and others prefer the increased sense of stability for higher speeds that comes with a stiffer deck, this choice will ultimately be up to your personal preference. Often confused with freeriding, freestyle longboarding is more about becoming one with your board. The desire to groove on your board is what has given rise to the sub-category of freestyle longboarding known as board dancing, which is exactly what it sounds like, dancing around on your skateboard. In addition to dancing, freestyle riders are all about some manuals and flip tricks when flowing through town. This is the creative side of longboarding, so anything goes. This discipline incorporates many technical skills, yet can be enjoyed by riders from any skill level. With those types of riding in mind a dedicated freestyle rider has two types of boards to meet his or her needs. Those who love flip tricks and manuals are often looking for a nice and light symmetrical board with two kicktails. While those who just have the flame of dance in their heart are looking for a very long board with a wide platform so there is plenty of room to move your feet. Here is an amazing video to give you an idea of the moves that go along with Freestyle riding. This is a form of downhill skateboarding that is more trick oriented and technical, yet less organized than downhill racing. Speed is reduced by many variations of maneuvers. The skills required for freeriding are stand-up slides, hands down slides, and footbraking. Drop-through, drop-platform, and top-mount longboards (usually symmetrical in shape) are very common in freeride longboarding. If you are choosing a drop-through deck, be sure to select one with very little flex. Flex is not a good idea for freeride setups. A good freeride board has the concave to lock your feet in, a relatively stiff/stable deck, and perhaps a tail or two for kick tricks. Check out these videos to get an idea of what freeriding is all about. Downhill longboarding is all about speed. The riders get into a tucked position putting all their weight on their front foot for maximum speed and stability. With both feet pointed almost completely forward they tuck their back knee behind the front knee to achieve ultimate aerodynamics. Downhilling has exploded as a sport across the world with races held on the hardest hills that’s can be found full of switchbacks and steep inclines. Because of the high speeds reached in downhilling most races require the rider to wear a full-face helmet and either leathers or full pads. This is an advanced discipline of longboard skateboarding and requires that specialized equipment be used. Drop-through, drop-platform, and top-mount longboards are common to the downhill scene. Downhill decks are very stiff and usually have a small to medium wheelbase around 29-32”. A concave or W shape concave is also very popular in downhilling as well as a micro drop to let you know where your feet are on your board without having to look down. Here is video of a downhill race to give you a better idea. The Wright Life carries some of the top longboard brands on the market. We can easily special order any deck you can not find in our store, and have it available in just days. The longboard market is one of the fastest growing sectors of the skateboarding industry. Manufacturers and riders continue to progress the sport through constant innovation and development. For more information on longboard components and helpful tips CLICK HERE.